Another post, another palette! I love YSL, as I never seem to be disappointed with anything that I try from the high-end brand. 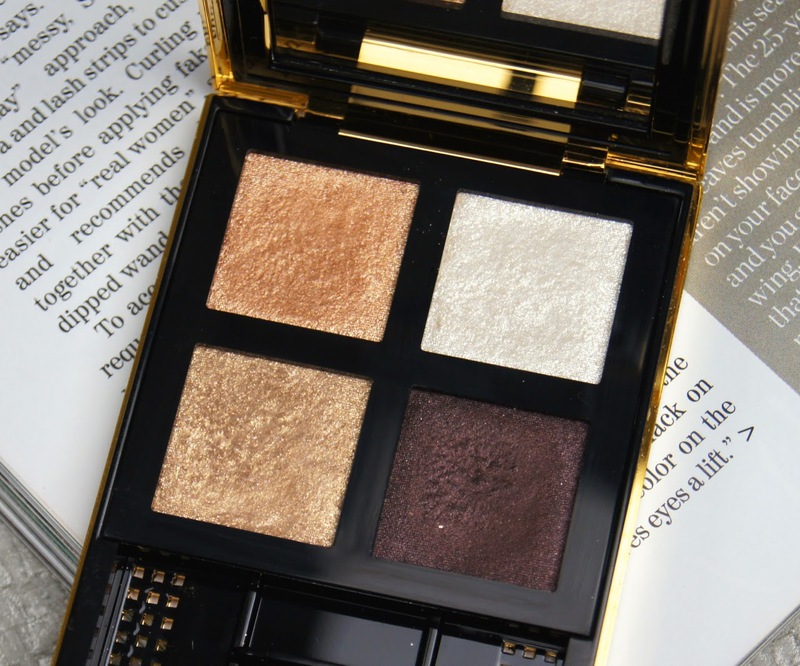 After adoring some of their foundations and lipsticks for years, I thought it was about time to road test their eyeshadows and settled for the YSL Pure Chromatics Eyeshadow Palette in 20, on a recent shopping splurge. 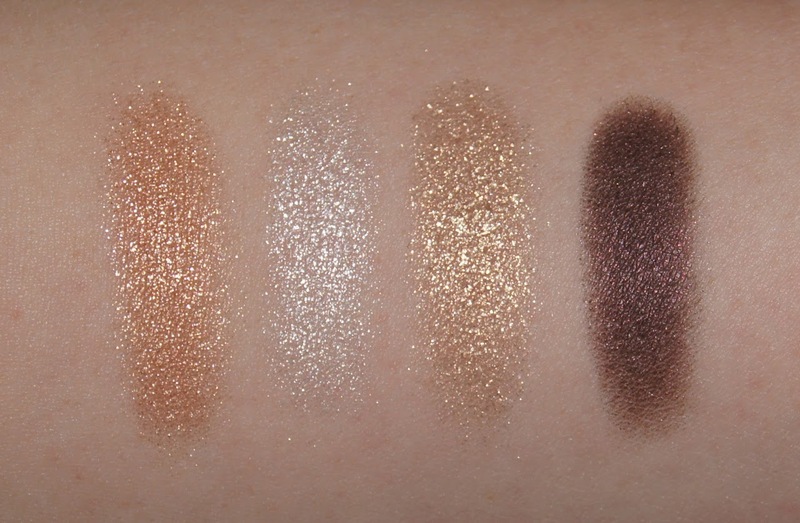 Included in the palette are four eyeshadow shades, with each tone complimenting one another. '20' comprises four, absolutely beautiful hues: a cool, frosted white, a soft, warm gold, a bright copper and an aubergine-y, deep brown. There aren't any matte colours within this palette and the lighter three shadows have an intense glittery finish, whilst the darker brown has more of a satiny shimmer running through it. You can use them all together to achieve a full on eye look, but they also look great individually, for a more effortless, relaxed feel. As always with my eyeshadow choices, the palette colours are extremely wearable and the golden, shimmery tones will be perfect for Summer. The Pure Chromatics shadows can be used both wet and dry, to give either a more subtle, ethereal effect, or something more vivid and striking. 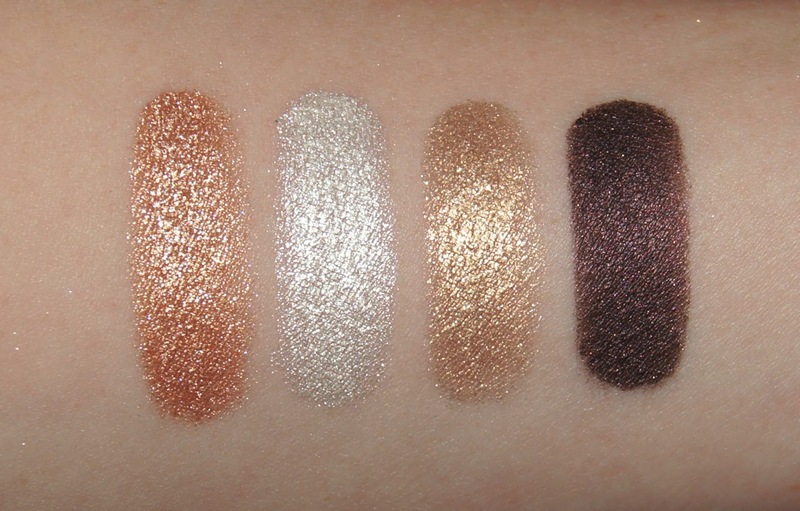 As you can see from the swatches below, how you use them, really makes a difference to the power of the pigmentation. YSL say themselves that when used dry, the shadows have a pearl finish, whereas when used wet, they're transformed into a lustrous glaze, which I completely agree with. Having a 75% concentration of pearls and pigments (apparently), as soon as they're mixed with water, the shadows rehydrate and the full colour and intensity, is released. Texture wise, they are just so incredibly soft and buttery. Even though they have such a high shimmer level, they are still smooth, especially when used wet. Using them dry does result in some glittery fall down as you apply, but it isn't anything disastrous, if you're careful or finish any face makeup after your eyes. Once blended onto the skin, they set, so they have great lasting power, don't need to be topped up and I haven't noticed any creasing during wear. 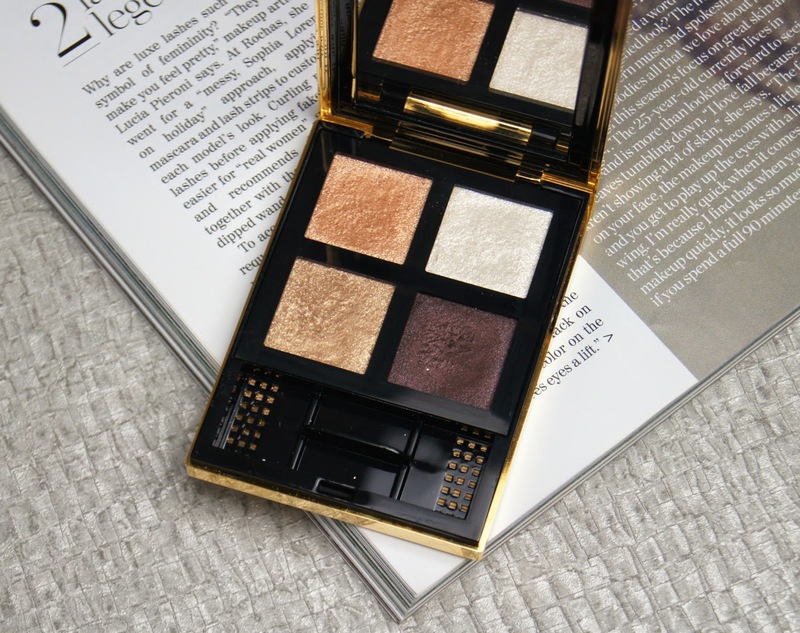 Encased in a sleek, gold compact, which isn't too large or heavy, you get the measly amount of just 5g of product, which is disappointing, especially as the palette isn't cheap, at £39. But, it is beautiful and this would be a great purchase if you wanted to keep it for special occasions. The compact has a large mirror which is great for your bag, but I rarely ever take eyeshadows out with me. As usual, there are a couple of eyeshadow applicators thrown in, which I haven't tried. But, they don't feel as cheap as others and the one meant for using with the wet shadows, is rubbery and flexible, so I'm curious to see how it works. Are you a fan of YSL make-up? Have you tried any of their eyeshadows? YSL make the best eyeshadows. I don't wear eyeshadow that often, but when I do, it's invariably YSL (with a bit of Urban Decay, which has a similar high level of pigmentation and soft texture, interestingly). These colours remind me of the colours I had in the first YSL compact I ever bought. Which was probably the best one I ever had.